A.W.T. EZ Access Drop Down Conveyors are heavy duty systems and a must to reduce costs, allow easy access for walk through and convenience for accessibility and cleaning your systems. When accessibility is required on your larger configuration conveyor line, you need the A.W.T. 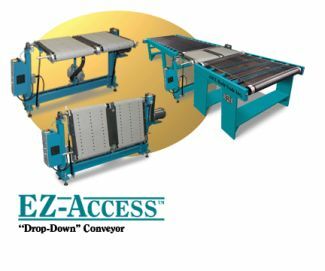 EZ Access Drop Down Conveyor! Our unit will seamlessly integrate in to your new or existing system, bolting to the floor or the machine itself. A.W.T. manufactures units with a manual or an automatic drop down. The up and down mechanism comes complete with a variable speed conveyor to move your parts smoothly through to your next station. Units are approximately 2 feet wide and drop down to be almost flush with floor for easy access.. When in this position it allows for easy maintenance, cleaning and walk through, eliminating the dangerous option of climbing over machinery and equipment or the time consuming option of walking around the complete conveyor configuration. Various styles of conveyor belts are available. We offer the option to tie it into your existing equipment avoiding the need to adjust the speed of the existing conveyor or as a stand alone unit. The conveyors speed can be set to meet almost any application. The drop down conveyors are available with our optional adjustable airflow vacuum belts. Vacuum belts help to control lighter weight sheets when running at faster speeds to “Hold-Down” products to the moving conveyor. There are over 5 widths to choose from to fit every application and production line.